Quinoa, the grain of the Incas, is a healthy, low glycemic carbohydrate that can add variety and nutrition to your diet. Quinoa has a better protein profile and a higher protein content compared to other vegetable sources of protein. Moreover, it is free of gluten and thus makes a healthy grain alternative for people with celiac disease or gluten intolerance. However, it is important to fully cook quinoa to enjoy its delicate nutty taste and benefit from its nutrition value. Raw quinoa cannot be digested properly and its undigested starches are likely to cause you gastrointestinal discomfort. Moreover, raw quinoa is covered by a substance called saponin, a toxic soap-like substance that can bind with some of the minerals you eat, preventing them from being absorbed, according to "Nutrition Research." Cooking quinoa will make it easier for your gastrointestinal tract to digest it. Cooking also increases its digestibility so your body can fully benefit from the important nutrients quinoa provides. 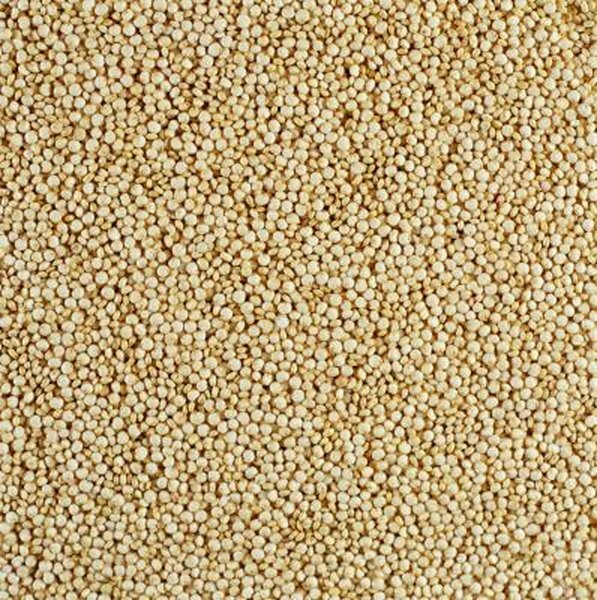 Before cooking quinoa, it is important that you rinse quinoa under running water until it doesn't produce any foam. Cook quinoa in two parts water, which means that for every cup of dry quinoa, you should use 2 cups of water. Bring to a boil and let simmer for 15 to 20 minutes, or until all the liquid is absorbed. Each 1/3 cup of raw quinoa yields about 1 cup of cooked quinoa. A serving of 1 cup of cooked quinoa provides 222 calories, 8.1 g of protein, 3.6 g of fat, 39.4 g of carbs and 5.2 g of fiber. It also contains many B vitamins, such as riboflavin, vitamin B-6 and folate, as well as the minerals calcium, magnesium, phosphorus and potassium. Eating quinoa raw wouldn't allow your body to absorb the important nutrients it contains and could even prevent the absorption of the nutrients found in other foods eaten at the same time. You can use cooked quinoa to have as a porridge for breakfast. Add diced pears, plain yogurt, walnuts and cinnamon or cottage cheese, almond butter and raspberries for a complete and satisfying breakfast. You can also serve cooked couscous as a side dish, instead of rice or baked potatoes. Add seasonings and mix in your favorite vegetables to accompany your protein. You can also use cooled cooked quinoa to prepare cold salads with cucumbers, spring onions, tomatoes as well as cooked beans and a salad dressing of your choice.